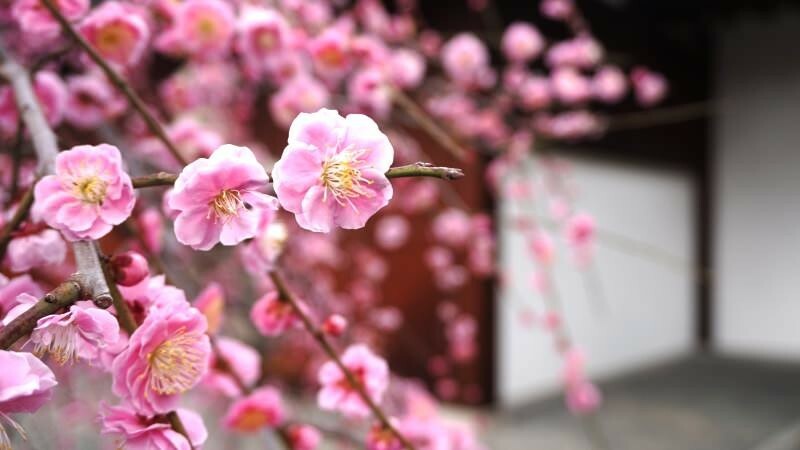 The plum blossom season is the interlude for the cherry blossom season, but at Jonangu Erika found the plum blossoms so beautiful she forgot all about cherry blossoms! 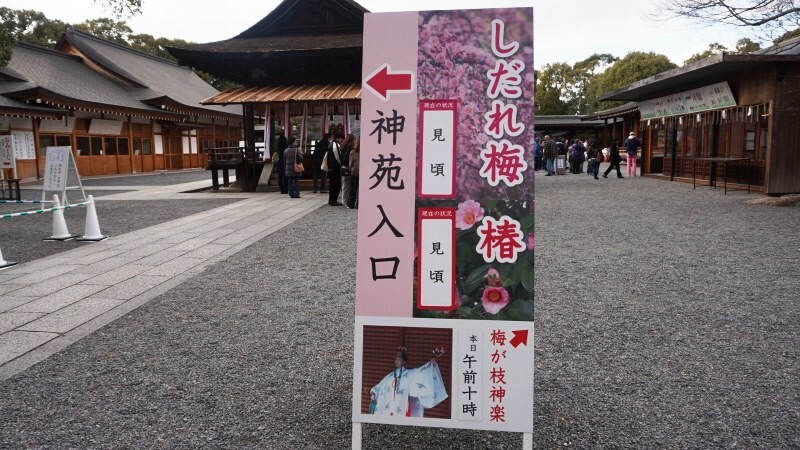 Jonangu Shrine in Fushimi Ward is one of the most famous places to see plum blossoms in Kyoto. 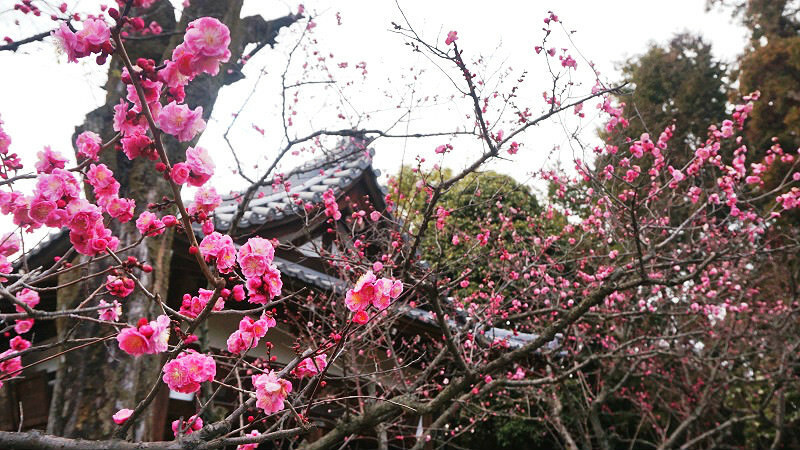 From late February to the middle of March there is a Weeping Plum and Camellia Festival at Jonangu Shrine, where you get to enjoy the sight of 150 plum trees and camellia flowers. 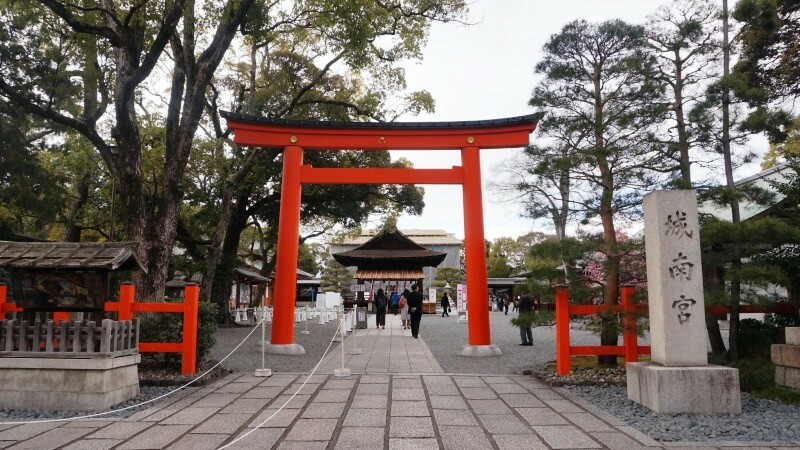 After walking for 15 minutes from subway Takeda Station, I arrive at Jonangu Shrine. After going through the torii gate, I right away spotted a plum tree! When I went to see the blossoms it was already the middle of March, but the blossoms were really pretty and getting close to their best. After seeing this plum tree I was really looking forward to seeing the plum blossoms in the Shin’en Garden. 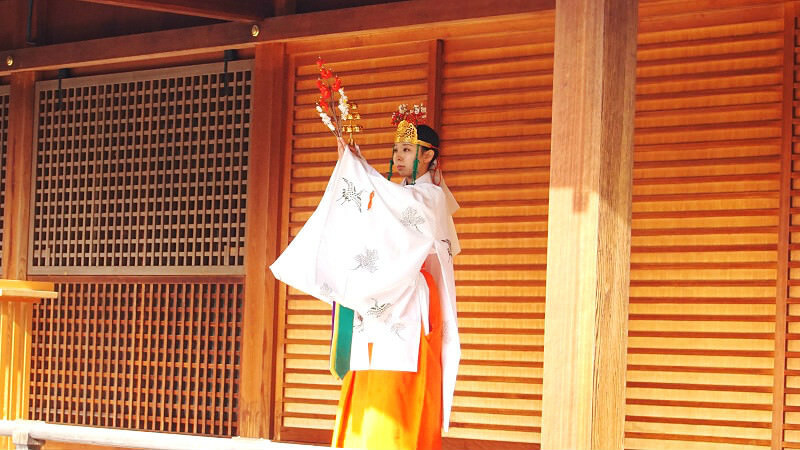 Also, at the Kagura-den by the main hall of the shrine, there is a kagura dance (Shinto-ritual dance for the gods) offering by a shrine maiden. Because it’s the plum blossom season, the shrine maiden has a plum blossom crown and is holding a plum branch while she dances. After seeing the kagura dance, it’s time to head toward the Shin’en Garden. 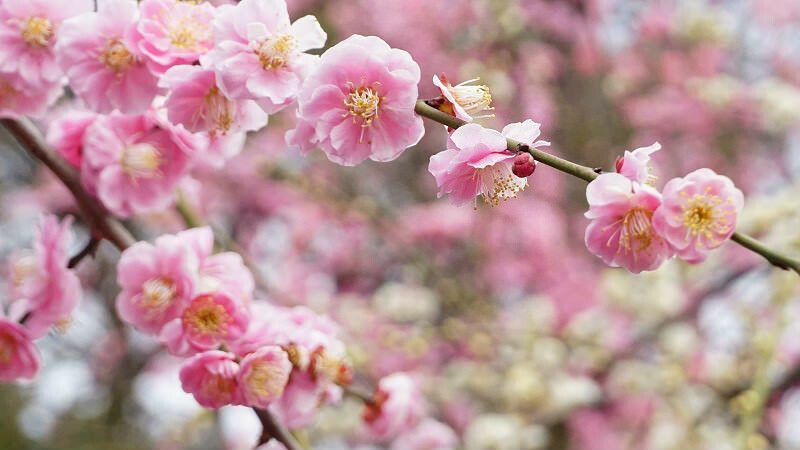 It was said that both plum blossoms and camellia flowers were at their best this day! After paying the entrance fee, we got inside and gradually started seeing more and more pink trees. There are five different sub-gardens inside the Shin’en Garden of Jonangu Shrine, and the Weeping Plum Blossom and Camellia Festival mainly takes place around the central garden called “Spring Mountain.” At the Shin’en Garden it is possible to see almost all of the plants that are featured in Japan’s oldest novel, The Genji Monogatari, so the garden can be enjoyed all through the year. Almost all of the 150 trees were in full bloom and it was pink all around me. There are also white plum blossoms. The contrast with the pink blossoms is beautiful. 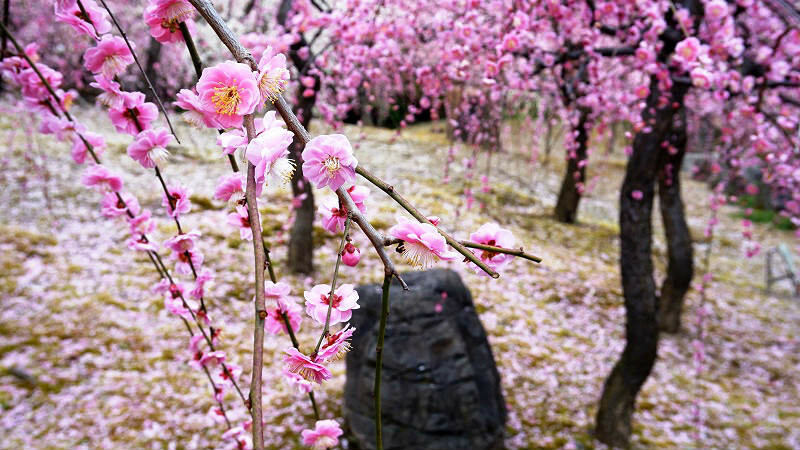 What is special about Jonangu Shrine’s plum blossoms is how many dense they are. They are so dense you can’t see the other side; your field of view is completely covered by plum blossoms. 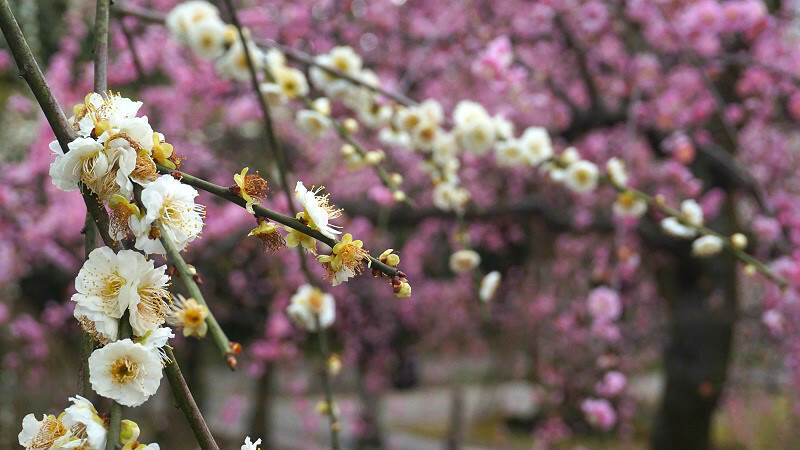 Plum blossoms are often seen as more modest than cherry blossoms because plum blossoms grow directly from the branch, unlike cherry blossoms which form groups, but the plum blossoms at Jonangu Shrine can be said to be luxurious and gorgeous. But when you look at them up close they are all blooming and look cute. The nice thing about weeping plum blossoms is that you can see the flowers up close. Japanese white-eyes are also lured in by the sweet fragrance of the plum blossoms. Japanese white-eyes are not that afraid of people so if you are lucky you can take pictures up close. 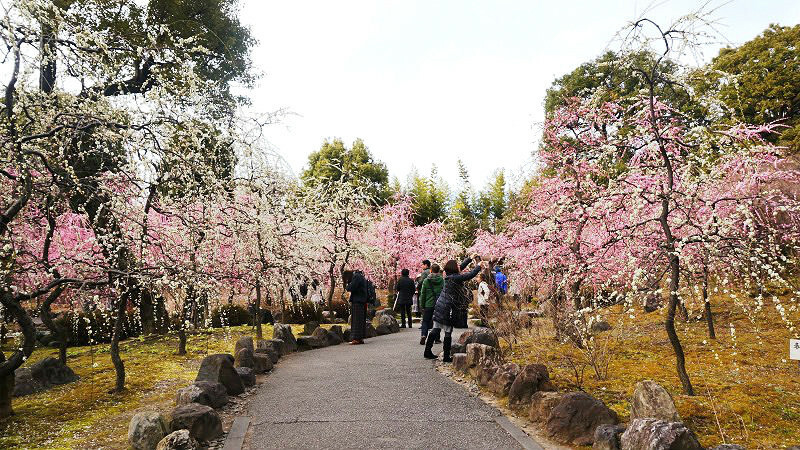 There are three ways to enjoy the Weeping Plum Blossom and Camellia Flowers Festival depending on what time you come. 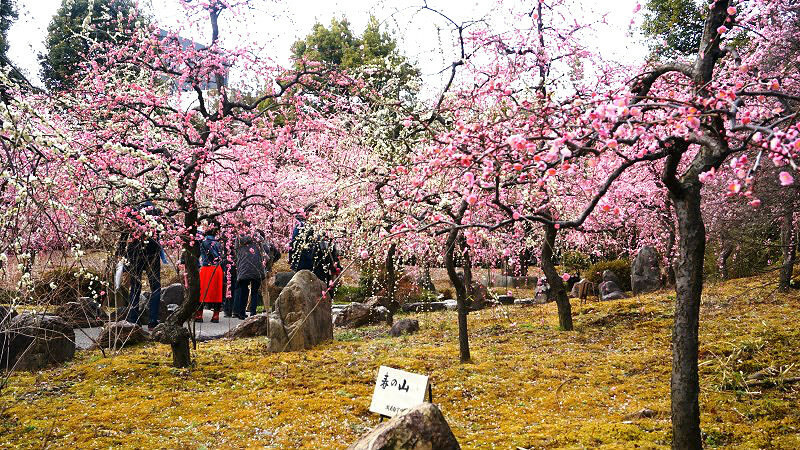 The first one is to see the vivid plum blossoms just as they start to bloom. 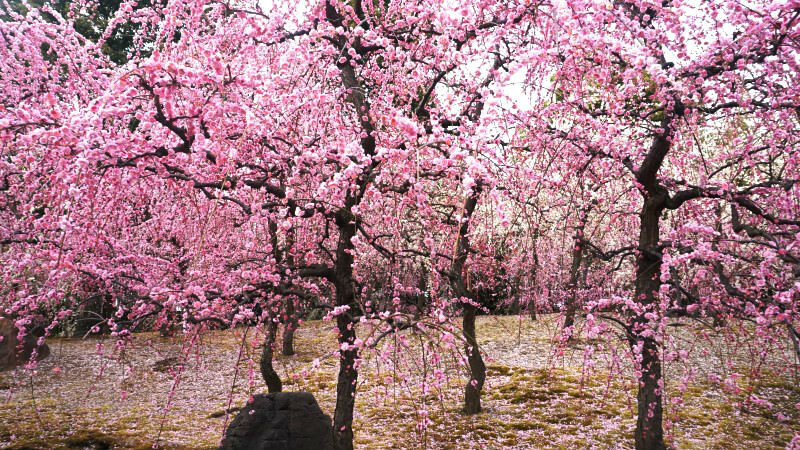 The second one is to do like I did and the see the plum blossoms in full bloom. 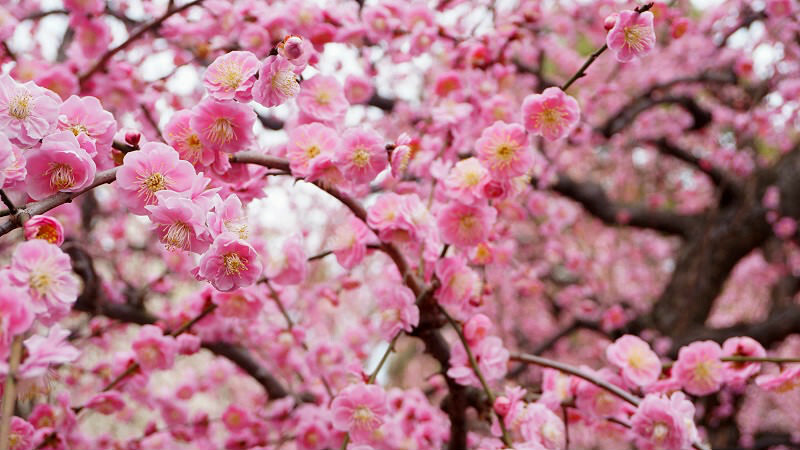 The third way is to see the plum blossoms after the petals fall down. 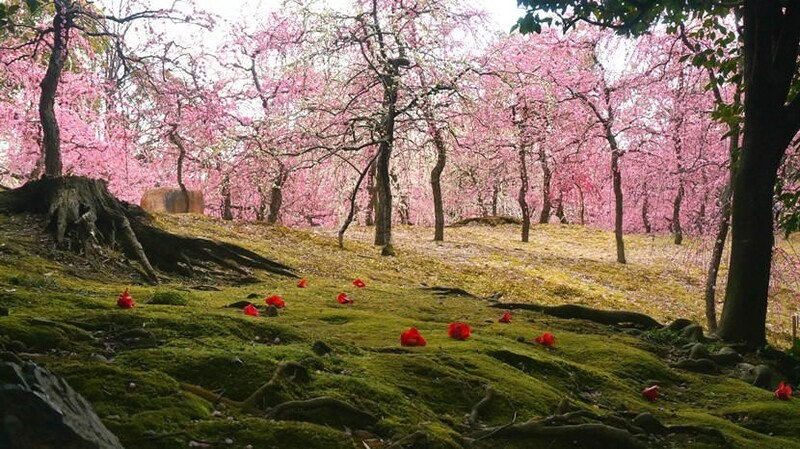 The way the petals of the plum blossoms cover the ground is sometimes called “plum blossom carpet” and it looks very mysterious. The best photo-spot has to be this place! The collaboration between the camellia that have fallen on top of the mossy ground and the weeping cherry trees in the background makes you almost think you were looking at a painting. 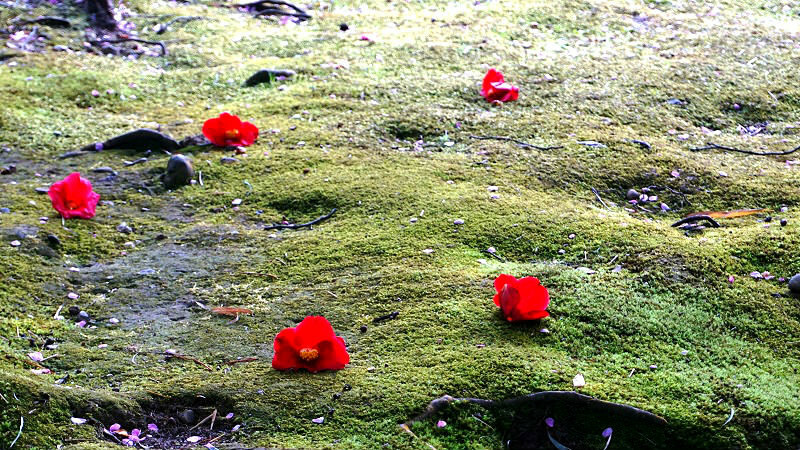 The camellia flowers that have fallen to the mossy ground. Unlike plum and cherry blossoms, camellia flowers don’t drop their petals but the whole flower falls down. 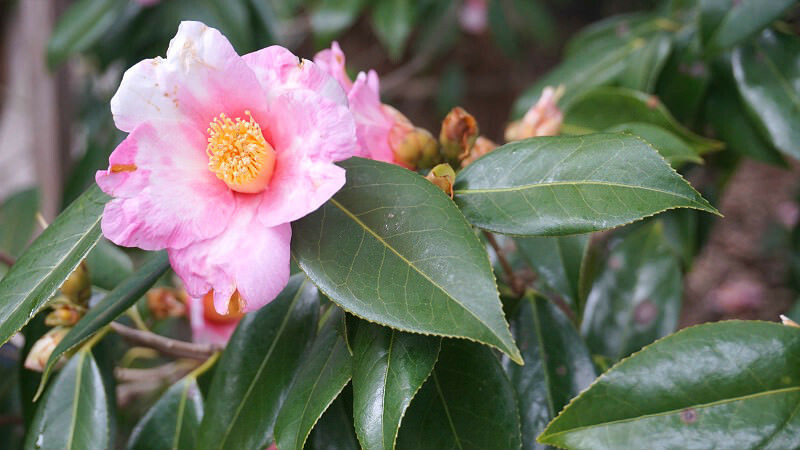 It used to be said that the way they fall resembles the way a human head falls when cut with a samurai sword; this is why the samurai of the Edo period thought camellia flowers bring bad luck. Still, there is something alluring about the way camellia flowers fall down. 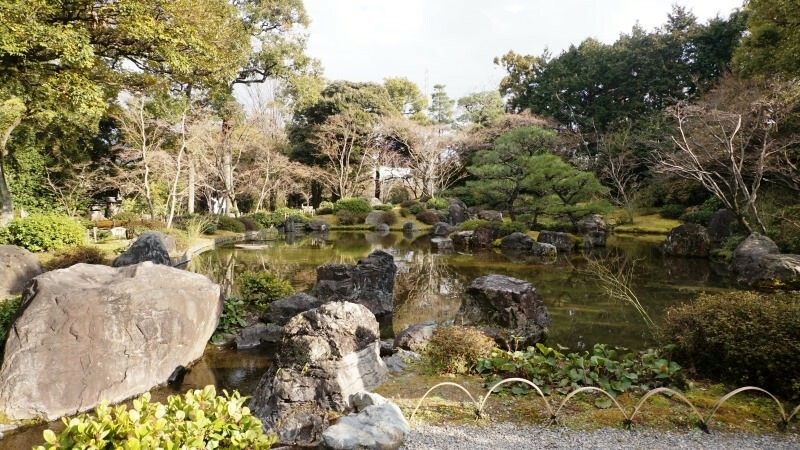 Besides from plum trees, you can also see 300 camellia trees in the Shin’en Garden. 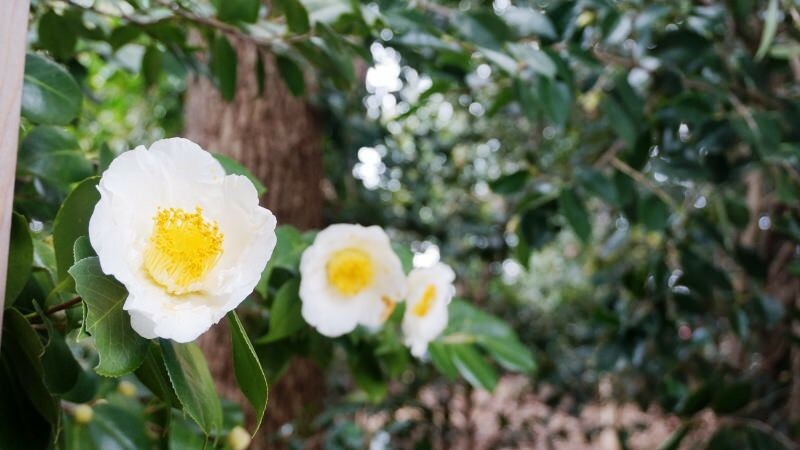 Besides the most famous red, there are also white and pink camellias. 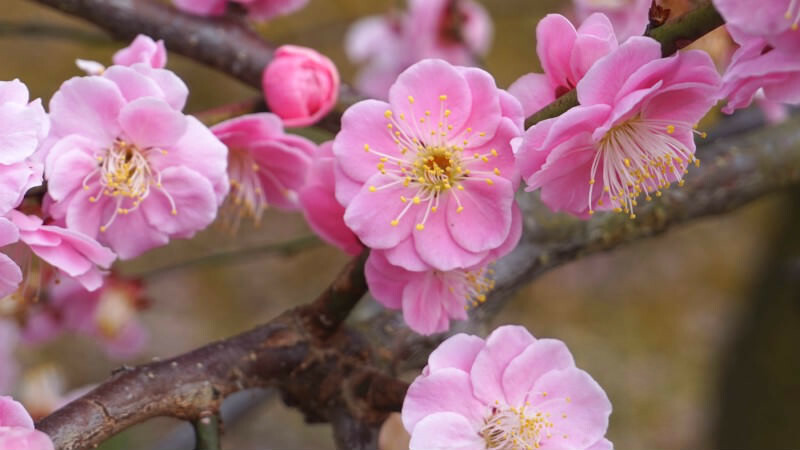 At this Weeping Plum Blossom and Camellia festival you can see the ephemeral beauty of both plum blossoms and camellia flowers at the same time. You are sure to find many fantastic scenes at this festival, so don’t forget to take your camera with you. It was the first time for me to see this many plum blossoms at once! 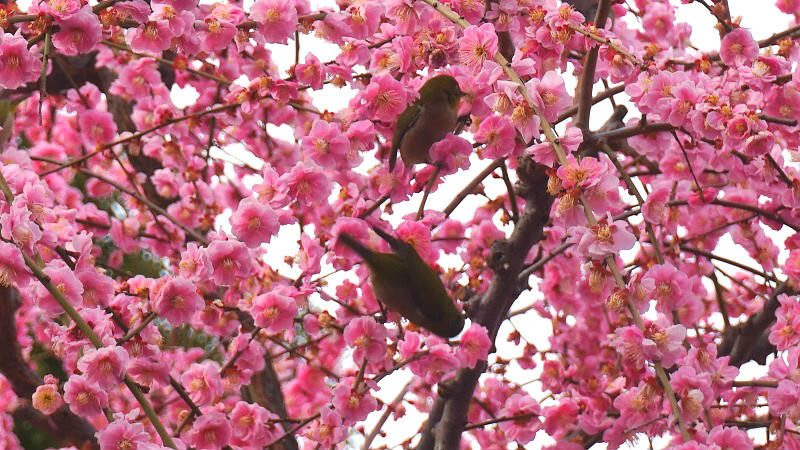 I felt the spring coming when I saw the Japanese white-eyes sucking nectar from flowers. When the plum blossoms are in full bloom the garden is crowded on Saturdays and Sundays, but I still think it’s worth it!